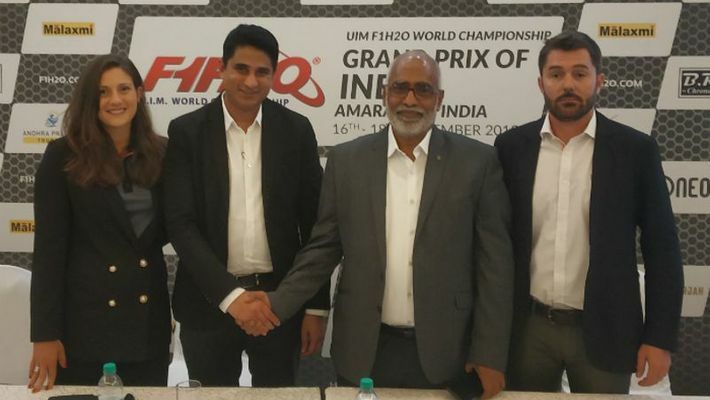 Bengaluru: Indian fans are set to witness high-octane powerboat racing in Andhra Pradesh’s capital Amaravati from November 16 to 18 with the UIM World Championship returning to the country after a gap of 14 years. The powerboats will be in action on River Krishna with local and international spectators set to enjoy some thrilling races over the three days. There will be nine teams in the fray for the fifth round of the World Championship, including Team Amaravati. The last time the event was held in India was in 2004, in Mumbai. 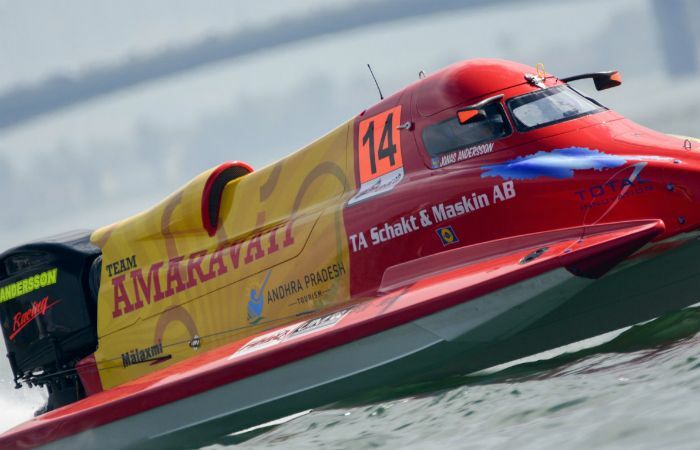 With this mega event, the government of Andhra Pradesh aims to promote tourism and has left no stone unturned to make the F1H2O India Grand Prix a success. “We are happy to welcome Bengaluru to come and witness the spectacular event that is followed by millions across the globe,” Srinivas Rao, CMO, Department of Tourism, government of Andhra Pradesh, said at a press conference in Bengaluru on Friday (November 2). “We are confident this will change the way grand sporting events are held in the country. 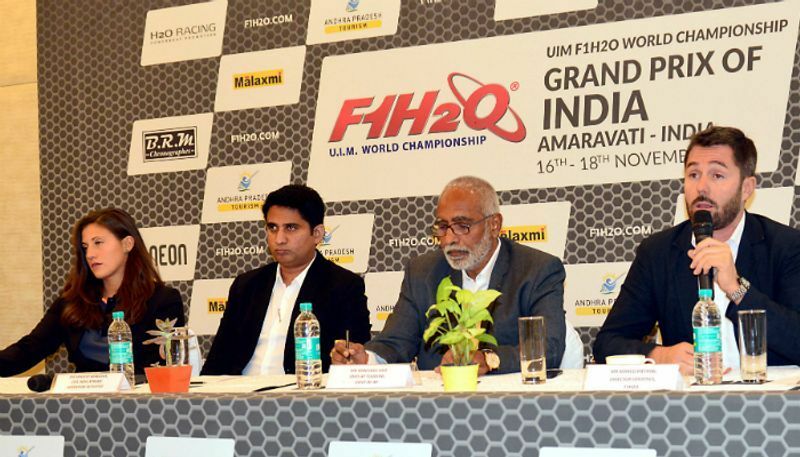 Amaravati is all set to put our country on the global sporting map with the F1H2O Grand Prix. The government of Andhra Pradesh and AP Tourism has put together elaborate initiatives in terms of hospitality and logistics for all visitors and participants. Our efforts are an endeavour to create solid resonance for Amaravati with F1H2O,” he added. 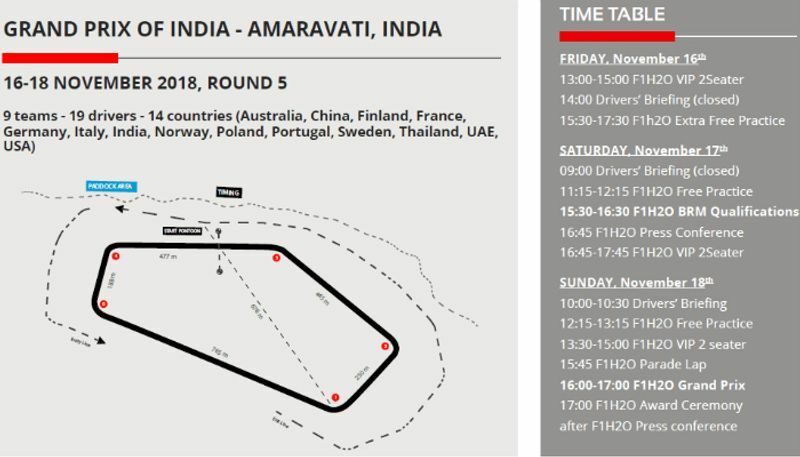 F1H2O’s director of logistics, Marco Pietrini said Amaravati was a “perfect location” for the world championship race and it was approved by UIM. “I am happy with the way this event is shaping up. The state of Andhra Pradesh and the tourism department has left no stone unturned to put up a gala show for all the spectators and visitors. I am confident that this initiative will take the sport to greater heights in the years to come. I won’t be surprised if India has its own team competing on the global arena in the coming years,” Pietrini said. The 23km stretch along the River Krishna will turn into a carnival site celebrating the UIM powerboat racing. Viewing galleries will be set up near Punnami Ghat and the Prakasam Barrage will be closed for the event. Sandeep Mandava, CEO, India Xtreme of Malaxmi Group, said this is not a one-off event and it will be held annually. “It would be our pleasure to have the sports enthusiasts from Bengaluru come in big numbers and witness the return of F1H2O to the Indian shores,” Mandava said. The F1H2O World Championship is the leading formula in single-seater inshore circuit powerboat racing and was sanctioned by the UIM in 1981. It is a multiple Grand Prix series of eight events taking place in Europe, the Middle East and Asia. Points allocated at each Grand Prix count towards the overall World Championship standings. In addition to the World Championship, points are also allocated for the BRM Pole Position and Team Championships and the Fast Lap Trophy. A three-tiered qualifying session is run over 60 minutes, the multiple lap Grand Prix run over a minimum 45 minutes, not to exceed 60 minutes. In 2018 nine teams, 20 drivers plus technicians and support staff from 12 countries will compete for the coveted World title. Over the last 34 years the sport has played out 272 Grand Prix in 32 countries across five continents, 13 drivers have captured the World title, 47 becoming members of the illustrious Grand Prix winners club. Of the 13 world champions seven are multiple title winners; Italy’s Guido Cappellini is the most decorated winning 10, Italy’s Alex Carella and American Scott Gillman with four, France’s Philippe Chiappe and Italian Renato Molinari with three each, Finland’s Sami Selio and Britain’s Jonathan Jones with two apiece. This year’s championship started in Portugal on May 18 and will end in Sharjah on December 15.